This community center was built by church volunteers whose house of worship was destroyed by Kobe earthquake in 1995. Materials were donated by a number of companies, and construction was completed in only five weeks by the 160 volunteers. The plan(10 x 15m) is enclosed within a skin of corrugated, polycarbonate sheeting. Within this, 58 paper tubes (325mm in diameter, 14.8mm thick, and 5m high), were placed in an elliptical pattern. The eclipse is based on those in Bernini’s church designs, and the space between the eclipse and the outer edge of rectangular-shaped site formed a corridor and provided lateral support. At the entrance to the eclipse, the spacing of the paper tubes was widened, and the facade fully glazed to form a continuous, unified space between the interior and exterior.This church was disassembled in June 2005 and all the materials were sent to a city in Taiwan. More than 2 million people became homeless when civil war broke out in Rwanda in 1994. The office of the United Nations High Commissioner for Refugees (UNHCR) normally supplied plastic sheets and aluminum poles to be rigged as temporary shelters. Rwandan refugees would sell the aluminum poles and then proceed to cut down trees to use branches for structural support. Contributing to already critical deforestation, it was obvious that alternative materials had to be found. A low-cost alternative, paper tubes, was introduced. The proposal was adopted and development of prototype shelters began. Three prototype shelters were designed and tested for durability, assessed for cost and termite-resistance. Since paper tubes can be manufactured cheaply and by small and simple machinery, the potential to produce the materials on-site to reduce transportation costs. In 1998, fifty emergency shelters were constructed in Rwanda and monitored to evaluate the system in practical use. When the Fukuoka earthquake struck in 2005, ten years had passed since the Hanshin-Awaji earthquake, the last time a seismic intensity was recorded over 6 in a large Japanese city. The main issue in the first phase at evacuation sites is the high density of refugees. Privacy is needed due to the lack of close relationships between neighbors in everyday life. Simple cardboard sheets were offered for insulation and to create a border between families. The cardboard was only used to cover the floor in early crowded times; after the population decreased, the cardboard was used to create partitions for night time privacy. 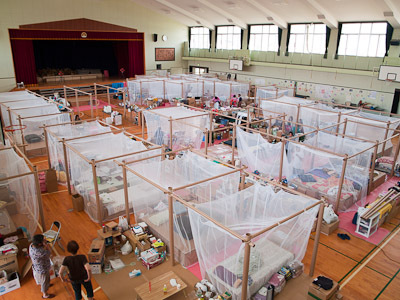 Constant revision was done whenever large earthquakes occurred in Japan, aiming to fit the needs of evacuation sites since the first attempt made in Niigata (2004). After the project in Fukuoka, wall structures that had been honeycomb boards were changed to a strut-beam structure using paper tubes that can be furnished faster and conveniently at any site, with white cloth for partitions. The joints were made of plywood, and ropes were used for braces .For flexible partitioning depending on the family size, the modularized unit dimensions were standardized at 180cm. For administration, it is impossible to forecast partition needs, so low cost and high speed were the priorities in developing this partition system. 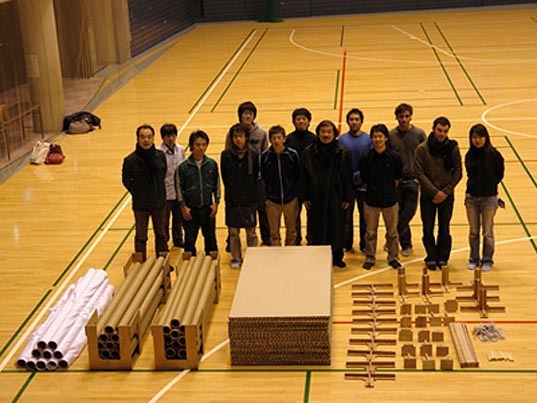 This collaborative project between Japanese and Chinese universities involved the design and construction of paper-tube-structured temporary classrooms at the elementary school struck by the Sichuan earthquake on May 2008. While most of the reconstruction assistance consisted of constructing temporary housing, we received a request from the Chengdu Chenghua District Education Bureau to rebuild the classroom buildings. These buildings had been officially designated as unusable and had been completely closed as part of the delayed reconstruction of educational facilities. We therefore designed temporary classroom buildings to be constructed using paper tubes, which are cheap, recyclable, reusable, and readily available on site. During the summer vacation, about 120 Japanese and Chinese volunteers worked together on the construction while deepening mutual understanding. We developed simple building methods and plans suited to unskilled people such as volunteers. With appropriate construction management, three buildings (nine classrooms) were completed in about forty days. These were the first buildings in China to have a paper-tube structure, and were also the first school buildings to be rebuilt in the earthquake-stricken area. Publicado por ekuazion en 12:36:00 p. m.